Real Sociedad goalkeeper Gerónimo Rulli has been one of many shot-stoppers linked with a move to Manchester City in recent months, with Pep Guardiola reportedly seeking high-level competition for Joe Hart. Back in May, AS reported City’s interest in 24-year-old Rulli and the most interesting detail was that Rulli is owned by a third-party investment fund that holds links to City. The story claimed that City’s investment in this fund gave them priority on Rulli, and that they could possibly even sign the highly-rated goalkeeper, who does not belong to Real Sociedad, for free. 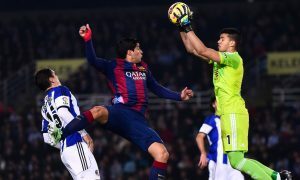 Juarros made it clear, though, that Rulli has a desire to stay at the Anoeta Stadium, which Argentine journalist César Luis Merlo recently backed up. Merlo claimed that Rulli has turned down City, Roma and Valencia to stay at the Basque club, primarily because he is guaranteed to start every week. However, the comments of Sociedad’s sporting director suggest that they may be having difficulty signing Rulli permanently and that Pep Guardiola’s side could yet have a say in the outcome.